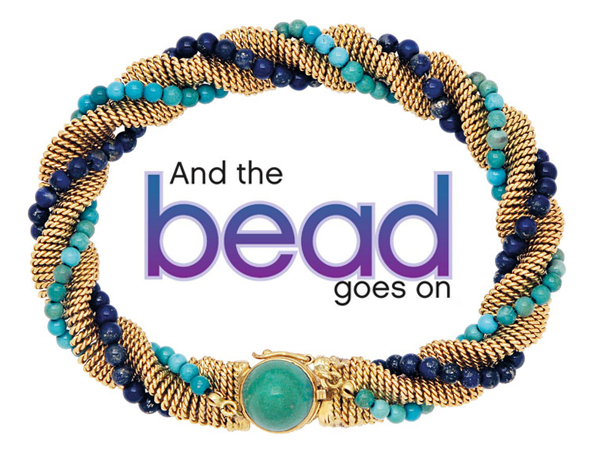 Signed Tiffany & Co. 18-karat gold mesh bracelet enhanced with rows of entwining turquoise and lapis lazuli beads. Ask any kindergartner to draw you a picture of a necklace and what you’ll see most likely is a simple series of round beads. This is also probably what first comes to mind for some adults when they think of a necklace, a bracelet, and even earrings. Historically and anecdotally, beads have been used for everything from a form of currency, to a cure for ill health, to a solace for the soul and indeed, beautiful adornment. The lapidary craft goes back thousands of years, with moderations of shape and design changing only slightly due to technological advances in tumbling, polishing, carving, and faceting‚Äîa mixture of artistry and geological science creatively mixed together. It may not be rocket science, but rock science isn’t far off. Ancient Egyptians prized lapis lazuli, turquoise, emerald, carnelian, jasper, and malachite. In effect, the symbolic scarab beetle is a variation of a carved bead. By way of trade routes, the Greek and Roman civilizations added onyx, garnet, amber, blue sapphire, and topaz to the palette. Usually, beads adorned fastening gold pins called ‘fibula’ for toga-type garments, as well as earrings, necklaces, rings, bracelets, and bands for the upper arm. Pectorals‚Äîthe ceremonial breastplate pendant that covered the chest area‚Äî and fabulously ornate headdresses were similarly adorned. Beads were made from anything and everything available in nature: bone, nut kernels, ivory, wood, mother-of-pearl, and coral, as well as gemstones in all manner of size, colour, and variety. All were designed to decoratively accessorize the human body. Symbolically, and continuing to modern times in Turkey and Greece, evil eye beads of blue glass have been worn as a protective talisman to keep nasty things from happening to the wearer. The Victorians preferred to keep evil at bay with a blue and green bead reminiscent of a peacock’s feather. Spherical motifs have long represented the sun, moon, and the planets‚Äîthere’s something inherently satisfying in touching them. Rosary and worry beads are counted for prayers or stroked to alleviate the pressure and stress of daily life. The simplicity of the shape is a gift to designers’ imaginations. Combining colour with texture brings paramount importance to the design, whether it’s gracefully sedate and traditional, or wildly avant-garde. Seaman Schepps uses multi-baroque, multi-coloured beads to create an exuberant profusion of over-the-top designs. With pastel-colour gemstones consisting of aquamarines, citrines, amethysts, peridots, chalcedony, and pink tourmalines, it’s a delicious hodge-podge and mish-mash‚Äîfaceted cuts jostle with polished, round are placed beside elongated, flattened between spherical, etc. Colour and shape juxtapose brilliantly on so many levels, with a few pearls and tiny diamonds blended in for good measure. A more sedate necklace contains a repeated series of rubies, sapphires, and emeralds. They’re the luxe versions of one of those edible candy bead necklaces strung on a stretchy piece of elastic. Marina B uses chunky clusters of polished gold beads for necklaces and earrings in a variation of the popular theme. Lapis beads form a distinctive floral cluster in a pair of earrings designed by Jean Schlumberger for Tiffany & Co., and David Webb’s coral bead Maltese cross brooches from the 1970s are inspired by nature. 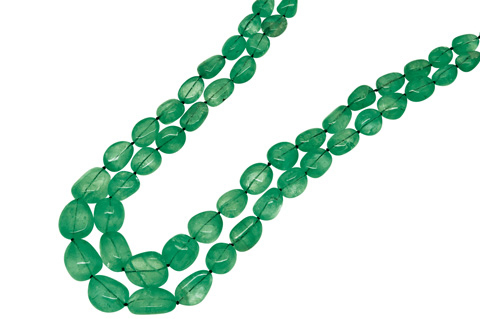 Double-strand necklace comprising 60 slightly flattened Colombian emerald beads, totalling approximately 550 carats. Gemstone beads are usually spherical, yet many are oval, flattened, elongated, briolette, cubed, drum-shaped, tubular, or carved‚Äîthe list is endless. If you sliced a bead in half, you would have yourself a couple of usable cabochons. Beads can be the minute size of a peppercorn like the tiny floating lapis lazuli bead that rests between rock crystal frames in a Cartier pendant. Beads can be separated by knots or by decorative rondelles made from stones like rock crystal and onyx. Lengths can be choker, collier, opera, and the longer sautoir. A necklace may comprise a single row or multiple strands arranged in random, graduated, or uniform size. Designers favour extremes, from the palest pastel of pink morganite to the deepest dramatic tones of a multi-strand coral torsade and in-between, the graduated shadings of ombre, from darkest to lightest or vice versa. Contrasting black and white ideas can be punctuated with clear crystals. Popular gem choices for beadwork are typically those without the refractory properties of light that give diamonds their special illumination. Picture opaque to semi-opaque jadeite, turquoise, lapis, tiger’s eye, amber, chalcedony, opal, banded agate, the extensive quartz family, and before the rules changed regarding endangered species, coral and ivory. Classic single strand of 28 turquoise beads ranging in size from 13.9 to 14.6 mm. Imbued with mystical and spiritual powers from ancient cultures like Aboriginal Australia to Chinese mystics, icy rock crystal is intensely pure. In the years following the First World War, transparent, clear, and colourless beads were called ‘pools of light.’ These smooth, solid, undrilled quartz beads were suspended in a decorative wraparound cage of understated metal wirework. The clear orbs had no annoying string visible to mar the internal purity and limpid clarity. Each in the series is joined to the next with delicate filigreed fetter and cable links. Theory has it that good luck can be captured within these spheres. A pair of shield-shaped diamond clips from the art deco period could be augmented with interchangeable carved ruby, emerald, or sapphire bead terminals. In the 1860s and ’70s, archeological and Etruscan revival pieces were often designed with a gemstone or gold bead terminal drop on each individual amphora that hung from the fringe. During the 1920s, sautoir-style necklaces were often composed of multiple rows of small beads of ruby, sapphire, pink tourmaline, amethyst, coral, jadeite, or opal, and then gathered together by a decorative diamond cap suspending a tassel of similar beading and edging. Even a very modest number of beads can be effectively used in a set of attractive cufflinks‚Äîgold chain linking adjoins the dominant feature, pairs of fluted emerald terminals carved to look like a melon crossed with an acorn squash, each accented with a tiny inset sapphire. With the near-endless choice available‚Äîall the colours of the rainbow, shapes, sizes, and texture‚Äîbeads are prime examples for adornment.